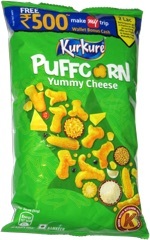 Taste test: I bought this because the words "snack bar" jumped out at me (and because I like snacks). I've tried energy bars and candy bars, but this sounded like a whole new thing. Kellogg's seems to be positioning Krave as a nutritious product to compete with the energy bars, while also offering a better taste, since many energy bars taste like they contain sawdust. 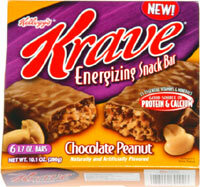 Well, there's no sawdust here: Krave tastes very good, pretty much like a candy bar. It's got most of the same elements as Snickers, with caramel, chocolate, peanuts and more, but Snickers is actually a lot more peanutty than the Krave. I'd recommend having it with a cold glass of milk. Good stuff. Smell test: Smells kind of like a Snickers.